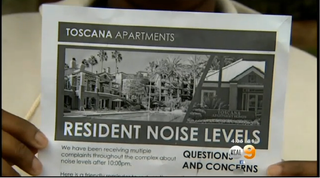 A flier distributed at an Irvine, Calif., apartment complex urges black residents to keep the noise down after 10 p.m.
Black residents at an Irvine, Calif., rental complex are up in arms over two fliers urging them to keep their noise level down at night, according to CBS Los Angeles. The fliers, which have gone viral on social media, were posted in two elevators at the Toscana Apartment Homes and bore what purported to be the logo of property-management company Equity Residential, the report says. But a representative of Equity Residential posted a message Friday on the company’s Twitter page saying, “Equity did not create or post this flier. We are outraged by its content and are actively investigating its source,” the news report says. One resident, a student at University of California at Irvine who asked not to be named, told the station that she believes the fliers are part of an effort to force black students out of the complex. “It’s all said to push us out,” the woman told CBS. “To make us not feel comfortable and not feel safe in this space so that we can leave.” The woman said she and her roommate received three noise complaints when there was no music playing in their apartment, the report says. The Irvine Police Department has taken a report and is investigating. While the housing is not affiliated with UCI, which condemned the fliers, the university has a history of “racist grievances, including videos created by fraternities in which members sport blackface and hold paddles labeled ‘slave driver,’ documented in a petition from the black student union this year requesting additional resources for black students,” according to Takepart, a website that focuses on social-justice issues. Read more at CBS Los Angeles and Yahoo News.